QUEBEC CITY — Even though Tori Woods and Crystal Chisholm are hopping around in skimpy bikinis, their boots are what catch the eye. The two good friends from Uxbridge, Ontario can bear the cold on every part of their bodies except, it seems, for the soles of their feet. Everyone has a limit, and a night in the Hotel de Glace will test it. Woods arrived at the wonder of a hotel a day removed from a week-long trip to Jamaica. Going from one extreme to another only delights her. She and Chisholm both grin at the thought of doing something most people might only attempt on a dare or during a bout of insanity. The Hotel de Glace, or Ice Hotel, is a 15-minute drive from Quebec’s old city and a world away from normal. It’s made entirely of snow (15,000 tonnes of it) and ice (500 tonnes) and features a 6,000-pound chandelier that glows blue like something out of the Fortress of Solitude. In its 12th year, the Hotel de Glace is that most unusual of travel destinations. In a country where most of us can’t wait to get away from the cold, this temple to ice draws people fascinated to see how cool life below-zero can be. The beauty of the hotel is astonishing. It’s the kind of thing Tolkien would dream up. 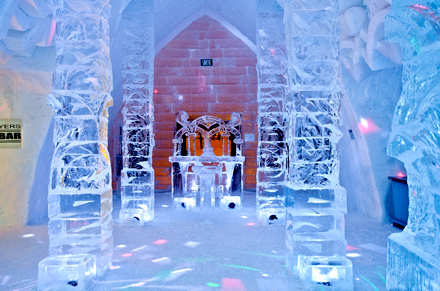 Columns of thick, clear ice decorated with First Nations carvings vault from the floor. Snow sculptures, some featuring figures in athletic poses, stick to the walls in a way that seems to defy gravity. This year, it took six weeks to erect the hotel, which includes a chapel (24 weddings are scheduled) and an ice bar (the Nordique, a drink made of vodka and Blue Curacao, is the most popular). There are 36 rooms and suites, some of which feature fireplaces that are insulated so no heat escapes to threaten the structure of the building — or, sadly, to warm the guests. Those fireplaces are perhaps the cruelest decorations ever invented. Within walls where the temperature averages minus-5 Celsius degrees, any opportunity for heat is coveted after a while. Even Woods and Chisholm, the two adventuresome women in bathing suits, eventually don toques, scarves and gloves, and soon enough they get out of the cold entirely. After posing for photos in their bikinis and snow boots for 15 minutes, they scoot off to the hot tub; overnight guests are advised to sink into hot water before going to bed. Once might be the operative word. Staying in the Hotel de Glace is not comfortable. Even after you’re curled into a toasty, hotel-issued sleeping bag, your face remains bare to the cold. The night air nips at your cheeks and nose, a constant menace you can’t get rid of unless you bandage your entire face. When sleep does come for me, it’s broken more than once by the need to breathe through the scarf wrapped over my nose and eyes. I tear away the cloth, huff for a while and then cover my nose again so I can escape into a dream. Your boots and winter outerwear are placed in the waterproof bag from which you remove your sleeping bag. All other belongings are to be left in a storage locker in the adjacent heated building called the Celsius pavilion. If left on a shelf in the bedroom, items such as watches and jewelry can freeze into place overnight. There’s no washroom in the hotel rooms. Anyone who must use the facilities, must go through the arduous routine of getting out of the sleeping bag, getting into their clothes and boots, and scurrying to the Celsius, where breakfast is served, and showers and toilets are available. Cano doesn’t stay the night, even though she wants to. The rooms, which cost $199 per night per person, are all booked. The hotel is only open this year from January 6 to March 25, and the rooms fill up quick. Once the hotel shuts down, the structure and all of the beautiful artwork created for it melts. Chisholm bought Woods the night’s stay as a Christmas present because neither of them had done anything like it before and, as Woods says, it’s good to explore the travel opportunities your home nation has to offer. “I’ve always wanted to see more of Canada. This is a unique experience you can’t get anywhere else and we travel all over the world and it’s kind of nice to see what Canada has to offer,” she says, while cozy in the Celsius’s lounge, a couple of hours before she ventures into her room and the ice bed that awaits. In the morning, her sunny disposition hasn’t changed. “It was a blast,” she says. As extreme as the Hotel de Glace may be, it isn’t so much of a challenge. A cheerful attitude and determined spirit will conquer it easy, Woods and Chisholm prove.